I don't think that I've yet mentioned how difficult it is to find a restaurant that's open for breakfast in Japan. I mean, they definitely exist, but they're shockingly rare. There are even coffee shops with "breakfast menus" that don't open until 11am. At this point, we've started to realise that it's sometimes better to just buy stuff from a convenience store instead of going to a sit-down place, which is actually a much better option then it sounds. In Japan, not only are there convenience stores on every other street corner, but they sell so much stuff; it's a bit ridiculous. Not only do they sell pre-packaged real meals and other stuff you may expect, but they even let you pay your bills and for your flights there and stuff. Crazy. Also crazy (and wonderful) is the number of vending machines you find everywhere. This has been a bit of an aside, but I really will miss having convenience stores and vending machines in large quantities like this when I go back to the US. After waking up in Hiroshima, it was once again an early start to the day, with a train to catch at ~9am. This time we were going all the rest of the way to the southern tip of mainland Japan, to the town of Kagoshima (the final stop of the Shinkansen). We had to make a transfer to a slower train for the last quarter of the trip or so, which took nearly as long as the earlier fast section. The plan was to get to the port from the train station, and then take a ferry to the island of Yakushima, where we would be hiking and spending the night. We thought we had budgeted enough time for that, but then confusing instructions for how to get to the port got in our way, and we suddenly found ourselves with 20 minutes until our boat left and no idea what bus to take, much less what time it would be arriving at. In a last ditch effort to make it on time, we hopped in a taxi, which took us right where we wanted to go. I have to say, getting dropped off at the door to our destination is something I could get used to. This was also the only leg of the trip we didn't have tickets for in advance, so we rushed to buy those, and then ran from the ticket office right onto the boat. They must have pulled the gangway up as soon as we had crossed it, because the boat started moving pretty much the same time that we sat down in our seats. Cutting it a little close, yes, but hey, we made it! You can sort of see the front bit for the hydrofoil there. It bends up for shallow water. I've called it a "boat" and a "ferry", but that doesn't really do it justice. 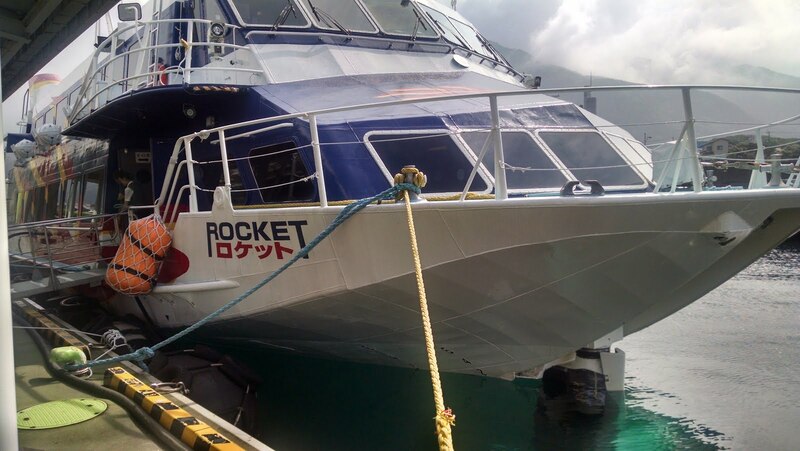 They bill themselves as a "rocket boat", which is actually much more accurate. This is a boat with a massive pair of jet-looking exhausts on the back, and when it gets going, you can see that it's actually a hydrofoil, meaning that the boat itself raises out of the water, with only two fins sticking down. The thing went 80km/h! That's crazy for a "ferry" for several hundred people! It covered the ~140km in just over 2 hours, which is pretty impressive. Plus, they were showing live TV on the screens inside the whole time; not that I could understand it, though there was a strange weather cast where they exclusively used physical props: table maps, magnets pushing cold fronts, poster board... that sort of thing. If you want to get an idea of where Kagoshima is, it's just south of Tanegashima, the island where the JAXA spaceport is located (as featured in 5 Centimeters per Second and Robotics;Notes. And real life too, I suppose). Once we landed, we headed to our accommodations, put down our stuff, and then scouted out the area. We found some lockers to hold our stuff the next day after checkout, got some food for our hike the next day at the supermarket, and stood on the seawall watching the waves crash against the rocks. We also headed out on a brief hike down a paved road towards a nature park. You know how some places have spiders, and some have snakes, and that sort of thing? Well, this island has crabs. 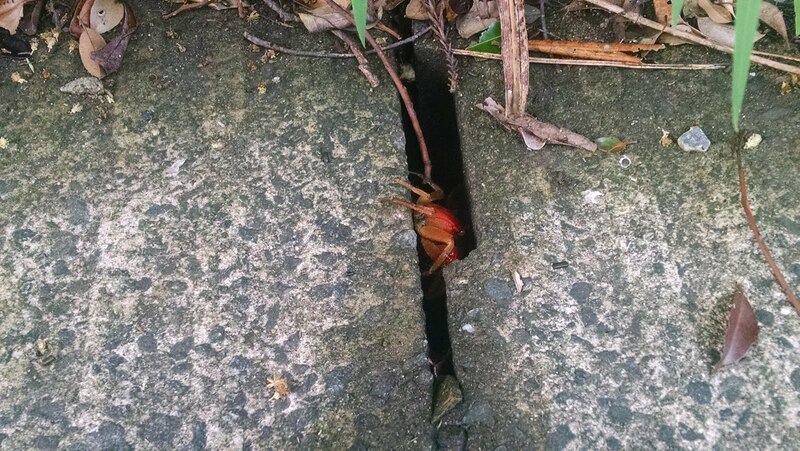 Like, as we were walking along the road, tiny crabs and big crabs would scuttle out of the way, and hide in the bushes and drain pipes. 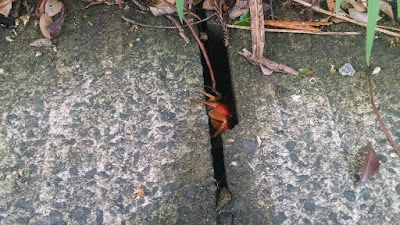 I didn't know that crabs could climb vertical walls like spiders, but they can, and it's kind of creepy. Imagine giving a spider claws... Ugh. Crabs should not be able to climb vertically! By the time our hike had finished, it was dark out, so we went to dinner and called it a day. We tried to go to the restaurant recommended by the person running the hostel we were at, but it seemed to be closed, even though the hours on the door said it was open. That seemed to be a fairly common thing in the town; it was pretty well dark and dead, so we went to the first open place we found, knowing nothing about it. 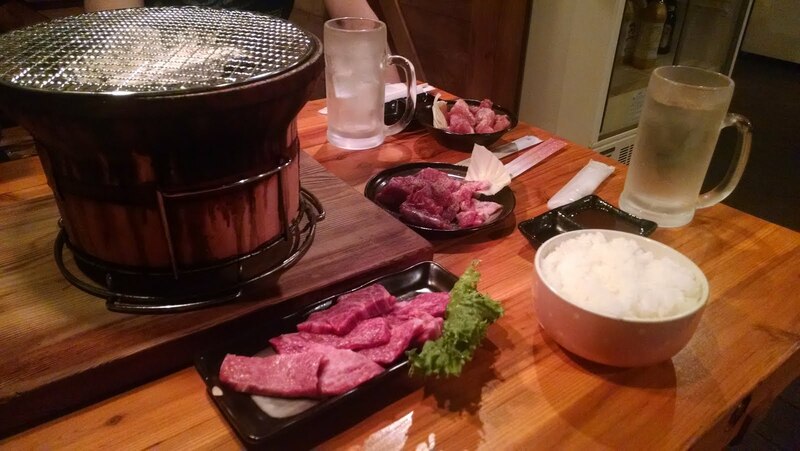 Turns out, it was Korean BBQ, where you buy the meat and they bring out a grill and you cook it yourself. It was really good. 5/5, would eat there again. By the time we got back to our sleeping arrangements, it had been another 10,000 step day. That meat at the bottom there was particularly fatty and good. 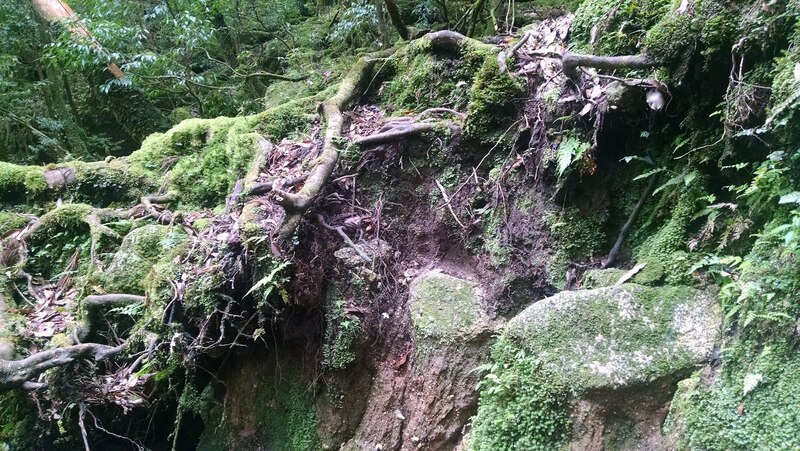 This was to be the main hike on Kagoshima day. 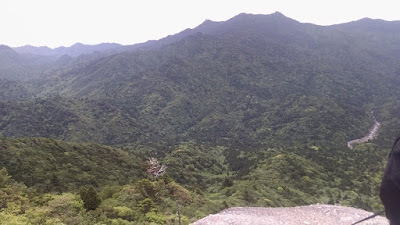 We wanted to go to the area known for inspiring the visuals of Princess Mononoke, with several ancient ceder trees (including one several thousand years old, and of the 100 largest trees in Japan). The bus left at 8:20, which was not a problem to wake up for because the city-wide PA system (that's apparently a thing) started playing Edelweiss at 7am sharp, for whatever reason. We were at the trail head by ~9am. We knew we had to be back to catch the 2:40pm bus back lest we miss our ferry off the island, so we planned our route to go on the 1 hour and 3 hour hiking paths, and set out. The first bit was pretty easy; the trails were all nice wooden paths with stairs and boardwalks and the like. And then, when we switched to the 3 hour path, suddenly it became nothing but rocks and roots. There was lots of clambering and climbing and mud and slipping to be had. Let's play "Spot the Path"! When we checked our watches to see our progress, we realised that we were going at a much faster pace then what the map people had suggested, so decided to go for broke and walk every single trail in the park. We eventually made it to the very far end of the trail system, a giant rock overlooking a ravine. It was supposed to take something like 4-5 hours, but we did it in 2. Not bad, really. Plus, this rock was about 1km above sea level, so it offered a spectacular view. Naturally, I couldn't get too close to the edge, but I could still appreciate the view from a safe distance. There were some other (Japanese) tourists up there, so we fumbled our way through asking each other to take group pictures of the others, and just generally had a good time. This picture really doesn't do the view justice. The path back was also similarly fast compared to the budgeted time, so when we got back to the trail head we had explored everywhere, but still had over an hour to kill before the next bus. Not that that was a problem. I was very glad for the opportunity to sit. Eventually the bus came, we headed back to town, and then we killed some more time before the ferry arrived. This time, the TV was showing coverage of President Obama's visit to Hiroshima. We actually got to watch live as he drove up (they had 20 minutes of helicopter camera footage of the cars driving), walked inside (they had 15 minutes of filming the exterior of the building), and then gave his speech. I was excited, because he was talking in English... and then the news people dubbed over his words. The net result was I have no idea what he said. After it finished, they just kept showing clips of it over and over again until we landed. It was neat to see him in a place I had JUST been to though. Back in Kagoshima, we once again checked into new accommodations, and then went out for supper. We found some sort of fast food Japanese food place, which was alright. And I do mean fast. From ordering to food arriving was probably 2 minutes. The only complaint that I had was the rubber band in my food, but whatever. My step counter seems to have crashed at some point today, but checking with the others, it seems to have been another 20,000 step day. Tomorrow will be our biggest travel day: we go all the way from this southern tip of Kyushu to partly up the northern island of Hokkaido. Wish us luck.